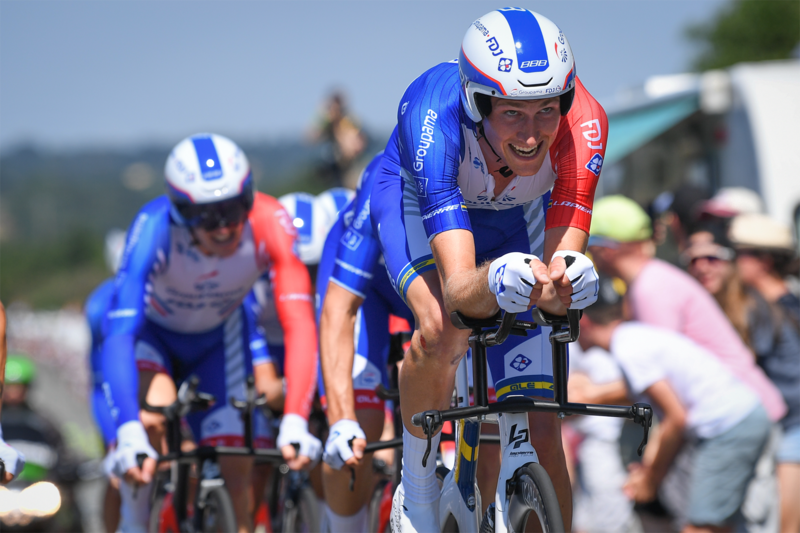 The 2018 Tour de France began with the sort of nervous opener that we have seen so often in the Tour's first week, with a chaotic end to the first stage and assorted tales of personal suffering and heroism. Stage one's thrilling finish showed that we are in for an exciting succession of bunch sprints as the race gets underway with several days of racing on the flat. When race director Christian Prudhomme signaled the start of the 201-kilometer first stage in the Vendée on July 7, a total of 176 riders from 22 teams embarked on the 3,500-kilometer Tour. Last year's winner Chris Froome (Sky) had a close escape, crashing into a field five kilometers from the end of the stage and losing over a minute on some of the other race favorites. Talking to reporters after the finish, Froome said “It's just one of those things. Fortunately, I'm not injured in any way.” The first few stages along the Atlantic coast followed a familiar pattern, with riders bunched together on narrow roads, several breakaways and then the sprinters' teams working to reel in the break in the final kilometers ahead of a big bunch sprint. And as so often in the first week of the Tour, there were a number of crashes in the final kilometers. But so far, the key riders in the teams on Continental tires have managed to avoid serious injury. 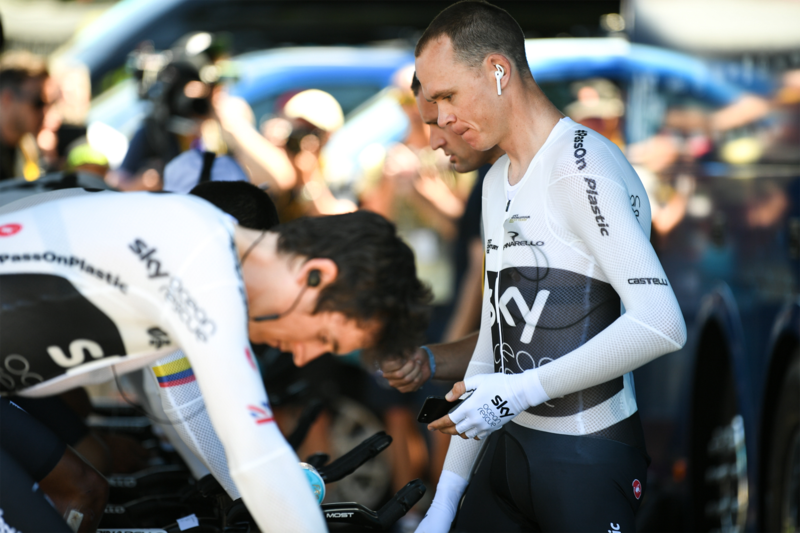 By Monday evening, Sky's team leader and four-time winner of the Tour, Chris Froome, saw his position considerably improved after a difficult start to the race. Although Team Sky didn't win Monday's 35-kilometer team time trial around Cholet, taking second place to Richie Porte's BMC Team, the British rider pulled back time on most of his rivals to improve his overall position. For many of the teams racing on Continental tires, the team time trial did not turn out quite so well. 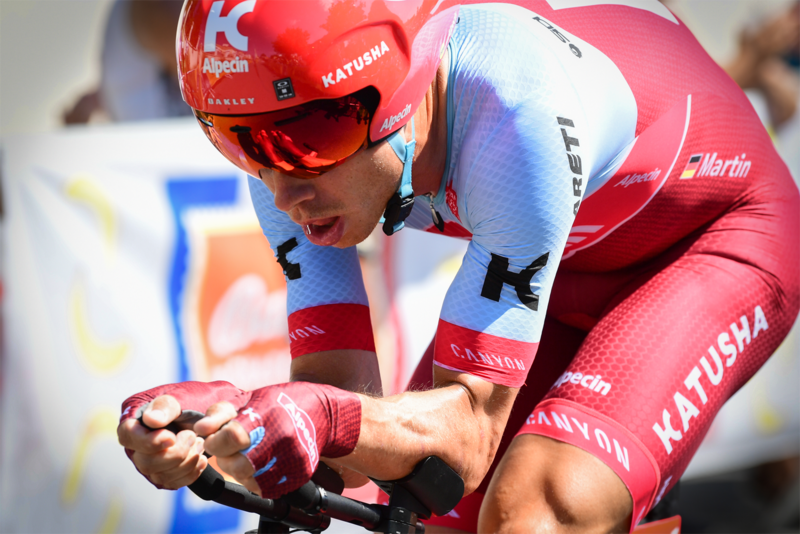 Katusha-Alpecin, with time trial specialist Tony Martin, finished in ninth place. Nairo Quintana's Movistar squad, also on Continental tires, ceded 54 seconds over the time trial's 35 kilometers. That left the Columbian climber, considered one of Froome's main challengers, a full 1:13 down on Froome at this early point in the Tour. Romain Bardet's predominantly French AG2R-La Mondiale team did better than expected in difficult circumstances, stopping the clock 1:15 down on BMC's time to take twelfth place, despite two of their key riders struggling with injuries. AG2R's time trial specialist Silvan Dillier was dropped early on, suffering with knee problems after a crash on Stage 2, and their other "workhorse" for the team time trial, Tony Gallopin, started the Tour with a fractured rib. Several of Froome's main rivals for the yellow jersey are also racing on Continental tires and are currently ahead of him on general classification. Vincenzo Nibali (Bahrain-Merida) and the rider carrying the weight of French expectations, Romain Bardet (AG2R) are both ahead of last year's Tour winner, who is philosophical about his current 18th place: "Crashing on the first stage wasn't the ideal start. But that's bike racing. There's a lot of road to cover before Paris. We are taking it day by day, and we want to be in good shape for the mountains." The best-placed Sky rider at the moment is not Froome but his right-hand man, Geraint Thomas, who is currently overall third behind BMC riders Greg Van Avermaet and Tejay van Garderen. The 32-year old Welshman is Sky's backup option should anything happen to Froome during the three-week race, necessitating a change in team strategy. While most of the 176-strong field are doubtless trying to reach the mountains with their bodies and chances intact, one man with different plans for the Tour is Marcel Kittel. The German sprint star, riding for Katusha Alpecin this year, is keen to add to the 14 Tour de France stage wins he already has to his name. Looking ahead to Tuesday's challenging 195-kilometer fourth stage from La Baule to Sarzeau, Kittel felt the slightly uphill finish over the last four kilometers could play to his strengths. "My third place on the first stage gives me confidence. Today could be the day," said the 30-year old sprinter as he started the stage. In the end, the stage win went to Columbia's Fernando Gaviria (Quick Step), his second in three days, ahead of world champion Peter Sagan (Bora Hansgrohe) and André Greipel (Lotto Soudal). In a close sprint finish, with the placings decided by just centimeters, Kittel was fifth across the line. Team BMC's Greg Van Avermaet started the stage as the third wearer of the coveted yellow jersey in this year's race, although the one-day Classics specialist is not considered a top general classification contender in longer stage races. So the teams using Continental equipment targeting the overall win won't be too worried about taking cycling's best-known race leader's jersey off Van Avermaet's shoulders at this point in the race, and he retained the yellow jersey ahead of Wednesday's stage. The other teams on Continental tires have also been doing their bit to animate the race, even if they haven't featured on the result sheet yet. The Groupama-FDJ team are also racing on hand-made tires produced in Korbach, and their rider Rudy Molard is currently the best-placed French rider in 40th place overall. But it is still early days in this three-week Tour. Given the right form, and the right "nose" for a break, a group of riders could escape and steal time over the peloton. And those are the conditions that suit Groupama-FDJ's riders. Dimension Data are riding for experienced sprinter Mark Cavendish, with Norwegian fastman Edvald Boasson Hagen also in the mix for sprint finishes. 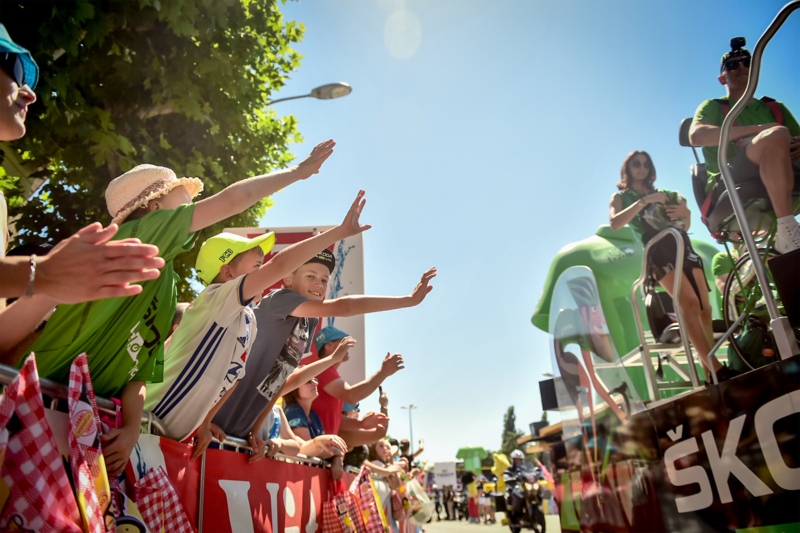 They were looking good on stage four until the one kilometer banner, when another rider dislodged Cavendish from his lead-out train and he found himself in the wrong position. At the moment, the Dimension Data rider is in 50th place overall. But with Cav's bunch sprinting experience and with Boasson Hagen by his side, we may yet see the former world champion win one of the remaining flat stages. Cavendish's hunger for a stage win is undiminished as he looks to add to his current total of 30 stage wins in the Tour. Ahead of Sunday's "Hell of the North" stage over the cobbles to the finish line in Roubaix, undoubtedly one of the first big highlights of this year's Tour de France, the riders face two more difficult stages along the Brittany coastline, with crosswinds likely to complicate things. Then the race turns towards Rennes, heading east across France, with the professional teams on Continental equipment sure to make their mark in this 105th Tour de France.